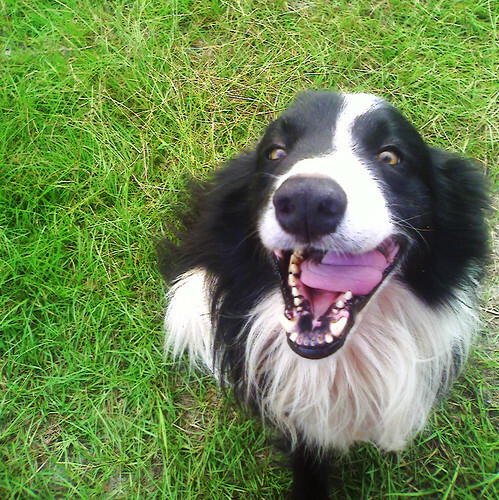 Posted This Before, I'm Sure - Ramblings of Mad Shutterbug & the Border Collie Bros. But not as an official "Pic'o'Day" and, well, I need a silly grin today so y'all might, as well. Most delightful part is, made with high-tech phone camera. Yah. High-tech. No, Srsly! I don't recall this being posted before, but you could post it every day for a year and I would still click that cut. HAI HOUDINI YOU BEAUTIFUL BOY! What a happy face! Definitely brings on a grin. Sooo Cute ! Can't help but smile back at him. No, Boss, I marked that one over at our place when Squrrl and I held the Our Portraits contest.